Look at those reflections in the pond – beautiful! Welcome to week 7 of our one year pond study. For the rest of the posts in this series please see here. Do you remember the ‘No Fishing’ sign from week 2? The pond is situated on the side of a road and when it used to fill up, it overflowed onto the road, flooding it. The conservators have dug a ditch the other side of the road and laid an overflow pipe which goes directly under the road to overflow into the ditch, preventing any flooding. The temperature of the water was 11 degrees Celsius. We didn’t take the temperature last time, but I’ll be doing it monthly from now on and I’ll chart it at the end of the year. Using the Periscope, L10 said she was able to see through the water, but not very clearly. Water pH we checked as before and it was the same at 8. I’m really looking forward to seeing if this changes at all as the weather heats up (if, in deed, it ever does!). Then placing our magnifier pot on top of a clear jar, so that light flowed in from all directions (making it much clearer to see anything) we checked out a sample of the water to see if a slight magnification helped any. It didn’t! This was a copepod called a Cyclops, on account of its single eye. This was of a wiggly microscopic Oligochaete worm. They were see-through to the naked eye, but you could sort of ‘see’ them because the movement of the water when they moved. Oligochaete worms (Phylum Annelida, Class Oligochaetae)(from the website above) have bristles which are used to grip when creeping between water plants or when on the bottom of a pond. Like many pond organisms they are very transparent. Their internal organs are clearly visible. Their stomach always give a nice glimpse of their prey. This was a simple sample of the pond water. It has so much life in it! None visible to the naked eye and in fact even magnified it was hard to make out shapes of some of the creatures. I can’t tell you how much fun this was! After I had done all I had wanted to, I left the children to explore. They were there for ages, making up slides and looking for more life. It was so good! I might have to get the children to do a microscopic analysis of the pond water each week, so we can build a clear picture of all the life there is to found in a pond. Loving our pond study! I have loved following your pond studies. Now I am just itching to find a periscope! Hello Charis! How are you? I often think of you and your family. I do hope your husband is doing well? I’m glad you’re enjoying our pond study, because we LOVE it!! I think our periscope was a charity shop buy as well as the microscope! Charity shops all over the world are going to be flooded with home schoolers looking for pond study equipment! Looks like a fun week. I love the Mandarin Duck. Thank you! We love our Mandarin duck too! Love this, Claire. Thanks for sharing at the Homeschool Review. That mandarin duck is a calendar perfect photo. We LOVE our Mandarin duck. Mum has just told us it has been joined by another one! 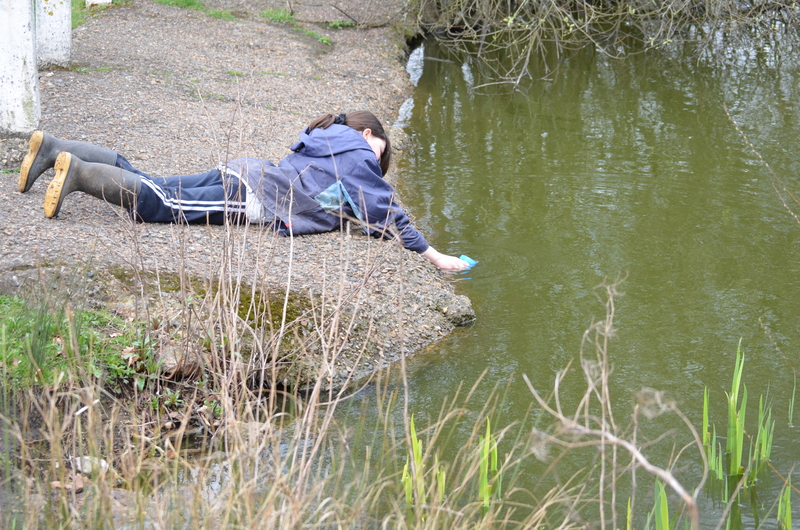 I am SO with Charis on this one… I need to find a Periscope, a Microscope, a Pond… even a Mandarin Duck will do!! I love these Pond Studies! Well done for igniting curiosity in your children for science all around them… I bet you they don’t look at that Pond in the same way anymore… and I BET you they more about that Pond than any other child in your village! Giggling at you needing to find a pond!! Yes, if you want to do a pond study, a pond IS rather essential! We really loved the microscope discoveries. Definitely repeating this again! ps do you have a separate shed for your charity shop finds?!! Oh, it’s too early for rolling about on the floor laughing, but Gary says that ALL THE TIME!! We have £5 per week to spend on charity shop finds. Do you know how much we can get for that….I just kind of pick up stuff we might need, oh, 5 years from now!! This is why our house is a permanent heap! But a happy one!! Never mind a shed. We could do with another house to put all our homeschooling resources in. But thinking about that Claire would just get all excited about that extra space and find stuff to fill it with! Lol. Have to say though she does get some cool stuff at charity shops and the kids are having a blast. Good work sweetheart. That’s a problem for us- no loft, no garage and our two bedrooms are situated in the loft area! Mmm, maybe I ought to stop shopping!! Your pond study has been so inspiring. I love how you’ve built on what you’ve studied in the previous weeks. The charity shop that you go to is a treasure cove! Where is it located?! My local charity shop is very lacking by comparison. The TV microscope is just the coolest thing ever. We live in quite a ‘nice’ area, so people give away stuff that is practically new and there are always lots of educational bits and pieces. Add that to the fact there are no less than 4 charity shops in our village alone, not to mention the 10+ in nearby towns and we’re in charity shop heaven!! Weeellll, I have been known to go to the extreme at times….Rabbit poop in the fire comes to mind! wow that looks fun. I love science and nature and what a great charity shop find! It really is lots of fun, far more so than I ever thought possible! Thanks for popping by! I look forward to these posts each week. We don’t have Mandarin Ducks, as far as I know. It really is beautiful! I’m not sure we’re meant to have Mandarin ducks. They certainly aren’t native to England, but he’s with us all year round. I never realsized Mandarin Ducks were so colourful. Your children really are learning in such fun ways. I love that they stay to discover more for themselves, another lovely one to share on Country Kids. Thanks Fiona. It’s great to link up to an English blog hop!! Those mandarin ducks are gorgeous. We don’t have any here, or at least not naturally. I know! It’s a great microscope! This post just showed up in my reader again, and I was very confused why you were back to week 7 again….. And then I read it, and understood. It’s fun to come back and read again. I have absolutely no idea why my old posts are showing up. I did a post on Moorhen chicks this week!! We do really enjoy our pond study. I’m so pleased we started! Wow I love this post, it’s really inspiring, as I would love to homeschool my little man but I am so disorganised I just don’t think I would be able to do it. Oh, don’t let disorganisation stop you! I’m as scatty and disorganised as they come but my enthusiasm for home schooling more than makes up for any lack of organisational skills! Go for it I say- it really is a rather special life! Oh miss angelicscalliwags!!! I have MISSED SO MUCH and have much HomeWork to do studying your last few posts–FIRSTLY, another thank you soo much for the detail you place in these well arranged posts! The details are the places I find what exactly works for my youngster and her learning abilities. Without your explanations in detail, I wouldn’t really know what to go looking for or study LOL! NOW I can devise a plan right for my LOs learning style and age appropriate activities! ill have another post SOON!!!?? ?THANK YOU!! I just love your enthusiasm! I’m so pleased you enjoy my blog! Sorry for not communicating for a few weeks – been re-organising our own routines. Having great fun – busy too. We’ll have to have a proper chat soon. In the mean time i’m going to try??? to send you some photos we’ve taken of visitors to our bird table. We’re having an entertaining time watching them just outside our living room window. Never realised there were so many varieties living so close. Hope you enjoy them. By the way, I’ve changed my signature. Who can decipher the code first? Ooooh, I’ve got it G & G!! But I’ll let the children give it a go as well before I tell them. I would have thought G & G in NI would have been more accurate! Or so I’ve been told……..